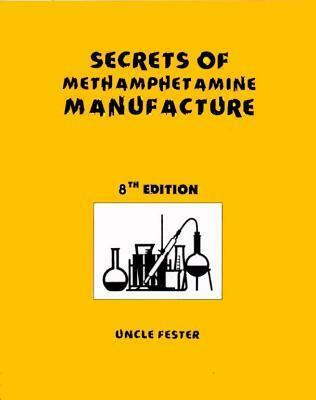 The latest version of the number one reference book in the field of clandestine chemistry. ** Note that this is an UPDATED 8th edition (so, it's actually 8.5) that includes an insert detailing the notorious "shake and bake" method ** The best book ever written in the field of clandestine chemistry has just gotten better in a new 8th edition. 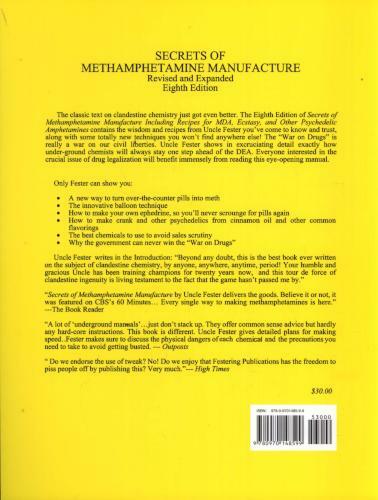 I have trained the champions of the field of clandestine chemistry for over 20 years, and this book gives the new techniques required for this constantly evolving field. I have uncovered a very easily done and supplied method for cooking your own ephedrine and pseudoephedrine from health food store and hardware store materials. This completely eliminates the need to show ID and buy adulterated and expensive pills containing these materials. I have also reconfigured older recipes to make use of the weaker or polluted materials now commonly found on hardware store shelves. This 8th edition shows the futility of politically motivated attempts by pandering politicians to regulate the private lives of individuals.